Charleston County’s equalization schools served local students for decades after their construction. Some high schools became elementary schools, some elementary schools became middle schools, and some schools were closed in the decades after racial integration. As the school buildings aged, Charleston County School District embarked on a multi-million dollar building effort to replace many of its historic equalization schools. The old schools did not meet seismic codes and CCSD chose to replace and upgrade many of the equalization schools. Some equalization schools can still be found across Charleston County (see http://goo.gl/iK83jA for a map). The historic Courtenay Elementary School (1955) has an outdoor exhibit telling the history of equalization schools, located across Meeting Street from the Charleston Visitor Center. 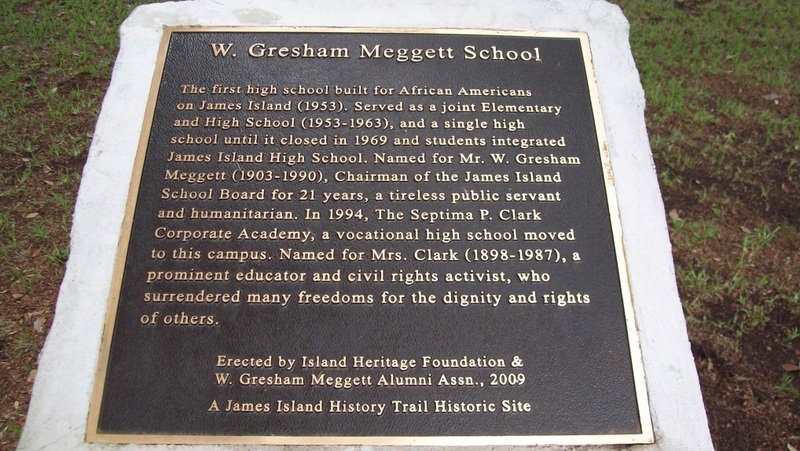 Visit the W. Gresham Meggett Elementary and High School on James Island, a stop on the James Island History Trail. C.A. Brown High School, now the campus of Trident Technical College, has a wealth of information in its library on the history of the school, and a recently-unveiled historical marker sits out front to tell the history of the school (Columbus Street Elementary/Wilmot Frasier Elementary School, another black equalization school, sits across the street from C.A. Brown High School). Other campuses live on with new schools in historic places, such as Burke High School and Sanders-Clyde Elementary School in Charleston, Haut Gap High School on Johns Island, and Baptist Hill High School in Hollywood. The University of South Carolina Press, 2006. Bartels, Virginia B., ed. “The History of South Carolina Schools.” Columbia: Center for Educator Recruitment, Retention, and Advancement, n.d.
Brown, Millicent. “Civil Rights Activism in Charleston, South Carolina, 1940-1970.” PhD. Diss., Florida State University, 1997. Carawan, Guy. Ain’t You Got a Right to the Tree of Life? : The People of John’s Island, South Carolina. New York: Brown Thrasher Edition, 1989. Coakley, Joyce V. Sweetgrass Baskets and the Gullah Tradition. Charleston: Arcadia Publishing, 2005. Felder, James L. Civil Rights in South Carolina: From Peaceful Protests to Groundbreaking Rulings. Charleston: The History Press, 2012. Fields, Mamie Garvin. Lemon Swamp and Other Places: A Carolina Memoir. New York: The Free Press, 1983. Meffert, John, Sherman Pyatt, and Avery Research Center. Black America Series: Charleston, South Carolina. Charleston: Arcadia Publishing, 2000. New South Associates. "Charleston County Historic Resources Survey Update." Charleston County, 2016. Pyatt, Sherman E. Burke High School, 1894-2006. Charleston: Arcadia Publishing, 2007. Smith, Daniel, Jr. African-Americans and Charleston: Histories Intertwined. Charleston: Daniel M. Smith, Jr., 2010.
vol. 66, no. 3 (Autumn 1981): 209-277.